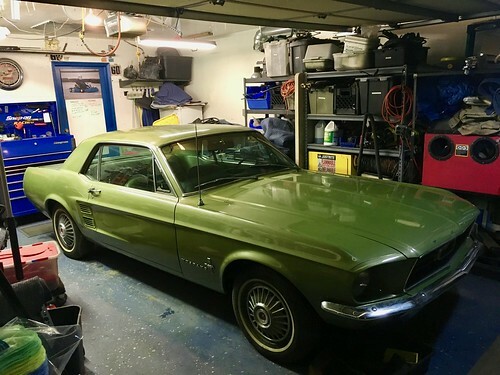 After about 6 months I’m finally able to get the Mustang into the shop. A 67 Lime Gold Coupe bought in May of 67. Basic model, PS, no AC, 4 wheel drums, two tone lime gold/ black interior. It was a true secretary car used as a DD. The mother of one of my dad’s high school friends was the original owner. She put about 54k on it until 1982 when he got it as part of an estate sale, house, furniture, whole kit and caboodle. Between 1982 and 2007 he put another 70k on it for a total of about 125k now. He was using it as a regular driver though not his only. Due to health it was parked in 07 with the intention of getting back to to driving it. But, well, life happened and it’s set every since on stands. Now it’s my turn to drive the car. from unleaded fuel. It’s a San Jose C code smog pump and all with a C4. only thing that hasn’t been opened over the years. for install except for the back seat which is still in good shape. the tank for 11 years. The tank was new from the rear end crash damage. but for now just get it back on the road. This week, fluids, wires, plugs. Bring it to life running on a gas can. movement though it is in neutral. were new when parked. The MC looks like a museum piece. Hard lines too. I’ll at least rebuild it if the core is in good shape. I want it to start, run, drive and stop in the next couple of weeks.